The Royal Melbourne Institute of Technology University (RMIT University) in Melbourne and University of Peradeniya, Sri Lanka entered into a Memorandum of Understanding for a joint Doctoral Degree (Ph.D.) programme between the two Universities for Engineering students. After several rounds of successful negotiations between the two institutions that lasted over 2 years, the MoU and the Cotutelle Agreement were signed in the latter part of 2018 at the University of Peradeniya. Facilitated by the Consulate General of Sri Lanka in Melbourne, Professor (Mrs.) Sujeeva Setunge, Deputy Dean (Research and innovation) for the school of Engineering at RMIT University, initiated the process of the establishment of this joint Ph.D. programme with the Sri Lankan Universities. The doctoral programme is focused on enhancing research capacities of the students of the respective universities which will mutually benefit both the institutions and the students. During the programme students will spend two years in Sri Lanka and one year at the RMIT University in Melbourne. RMIT University will be funding the entire cost of the year in Melbourne as well as the tuition fees for the full three years. 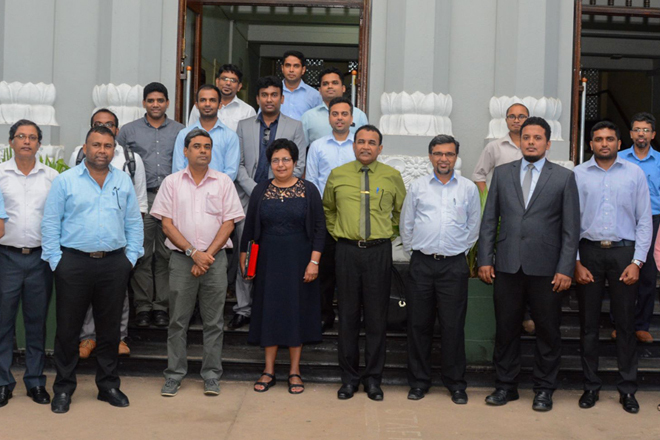 The inauguration of the joint Ph.D. programme was held at the Faculty of Engineering, University of Peradeniya with the participation of the Professor Upul Dissanayake, Vice Chancellor/University of Peradeniya, Professor Sujeeva Setunge of the RMIT University, Prof. Leelananda Rajapaksha, Dean, Faculty of Engineering, University of Peradeniya, Prof. P B R Dissanayake, Senior Professor, University of Peradeniya, Prof. Jayalath Edirisinghe, Head/Civil Engineering, University of Peradeniya and academic staff members of both RMIT University and Department of Civil Engineering of University of Peradeniya. Consul General of Sri Lanka in Melbourne Mr. W G S Prasanna appreciated the commendable efforts of Prof. Setunge who is an alumnus of University of Moratuwa and a distinguished academic and a researcher of RMIT University in establishing this landmark project between Universities in Sri Lanka and the RMIT.